Shenyang J-11 is a licensed-built version of the Sukhoi Su-27 fighter aircraft. Image courtesy of Defense Dept. photo by US Air Force Staff Sgt. D. Myles Cullen. The cockpit of the J-11/ Su-27SK can accommodate a single pilot. Image courtesy of DoD photo by Staff Sgt. D. Myles Cullen, US Air Force. (Released). A close front view of the Su-27SK fighter aircraft. Image courtesy of Defense Dept. photo by US Air Force Staff Sgt. D. Myles Cullen. 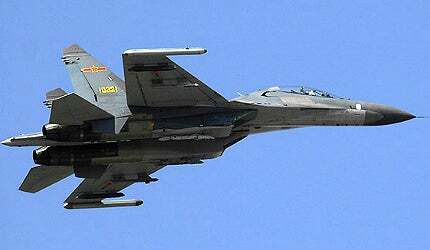 Shenyang J-11, or Jian-11, is a Chinese multirole fighter aircraft manufactured by Shenyang Aircraft Corporation (SAC). It is a licensed-built variant of the Sukhoi Su-27SK (Nato code name: Flanker) fighter. The J-11 is operated by the People’s Liberation Army Air Force (PLAAF). Shenyang J-11 is a highly-manoeuvrable fighter aircraft capable of conducting air-superiority and ground attack missions. Sukhoi and SAC signed a $2.5bn contract for the co-production of 200 Su-27SK fighters as the J-11 in February 1996. As part of this contract, Sukhoi was responsible for supplying components to assemble the aircraft at SAC. "Shenyang J-11 is a highly-manoeuvrable fighter aircraft capable of conducting air-superiority and ground attack missions." The first aircraft assembled in Shenyang was flight tested in December 1998. Full-scale production was delayed because of technical issues. About 100 aircraft were manufactured by 2003. Production ceased subsequently, as the basic J-11 variant did not meet the PLAAF requirements. Sukhoi offered its Su-27SKM fighter to China in 2003. It was a modernised multirole variant based on the Su-27SK. The PLAAF rejected the aircraft in favour of a domestic variant of the J-11. SAC unveiled a mock-up J-11B aircraft in 2002. It is an upgraded multirole variant of the J-11. The company delivered the first test aircraft to the China Flight Test Establishment (CFTE) for evaluation in 2006. Designed based on the Su-27SK, the airframe of J-11 is made of titanium and aluminium alloys. The fuselage section integrates the cockpit, radar sections and avionics bay. The basic J-11 version incorporates Russian-made components. The indigenously built J-11B uses the same airframe and is equipped with Chinese-built avionics and weapon systems. The J-11 has a length of 21.9m, wingspan of 14.7m and a height of 5.9m. The wing area of the aircraft is 62m². The aircraft has a maximum take-off weight of 33,000kg. The glass cockpit of J-11 accommodates a single pilot. It is equipped with colour multifunctional displays (MFDs), a head-up display (HUD), helmet-mounted sight (HMS) and an indigenous digital flight-control system. The avionics suite integrates an IFF system interrogator, attitude and heading reference system, automatic direction finder, electro-optic search and tracking system, INS/GPS navigation system, fire control radar and indigenous multifunctional pulse-Doppler radar. The onboard automatic monitoring system includes an early warning system, flight information recording system and emergency situation warning equipment. The aircraft is armed with a 30mm GSh-30-1 cannon. The ten hard points provided on the aircraft are capable of carrying wide range of missiles, including PL-12 radar-guided air-to-air missile, PL-9 short-range, infrared-homing air-to-air missile (AAM), PL-8 air-to-air missile, Vympel R-77 medium range air-to-air missile, Vympel R-27 medium-to-long-range air-to-air missile and Vympel R-73 short-range air-to-air missile. The PL-12 carries a high explosive fragmentation warhead for a maximum range of 100km. The aircraft also carries an unguided rocket launcher and free-fall cluster bombs. The electronic countermeasures equipment aboard the J-11 include radar warning receiver, chaff and flare dispensing system and radio jamming transmitter. "Sukhoi and SAC signed a $2.5bn contract for the co-production of 200 Su-27SK fighters as the J-11 in February 1996." The J-11 is powered by two Lyulka AL-31F or FWS-10A Taihang turbofan engines. Each engine is capable of developing a dry thrust of 75.22kN / 89.17kN and afterburner thrust of 123kN / 132kN. The FWS-10A TaiHang turbofan engine was unveiled during the 6th Zhuhai Air Show in 2006. The engine is believed to be similar to the Russian-made AL-31F turbofan engine in terms of technology and performance. The aircraft can fly at a maximum altitude of 19,000m. It has a rate of climb of 300m/s. The J-11 has a maximum speed of Mach 2.35 and a range of 3,530km. The maximum flight speed at sea level without external weapons and stores is 1,400km/h. The J-10 (Jian 10 or Fighter 10) is China’s indigenously built multirole fighter aircraft developed by the Chengdu Aircraft Industry. A single-seat, multirole stealth fighter aircraft, the Chengdu J-20 is manufactured by Chengdu Aircraft Industry Group (CAIG) of China.